Another picture from our trip to Cafe Hollander a couple weeks ago... I'm a huge fan of Belgian Ales, and this one is no exception. 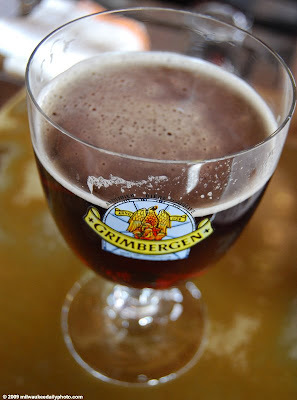 Grimbergen Double is a great ale, using a unique combination of malts and a second fermentation. The result is an aroma that pleases the nose and a taste that goes well by itself or with food. As any Belgian fan knows, each brewery has its own glassware with a special shape and size, and of course, a logo!